To build on the previous post, I thought I would illustrate a parachute dry fly with a foam post. The good news is that the post can be low and very visible to the fisher-person, but it is hard to build a good thin body in a continuous taper when dealing with the hidden (buried) tied in end of foam. I am more likely to swing a large fly for a trout, but there is no doubt a mayfly in spring on the surface is a lot of fun. Here is a representative of my sulphur for next spring. 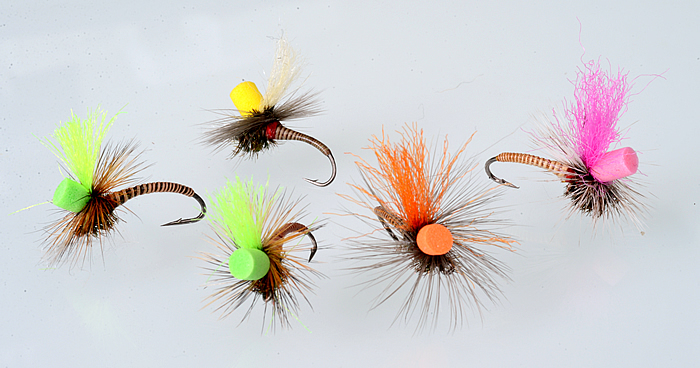 I tied these flies in sizes 14 and 16, 16 is shown. As I prefer the flies in the film of the water, my default form is the parachute post. I use two types of post – foam and poly yarn – where I select the base on the water I expect to fish. Foam post for pocket and rough water and yarn for the slower slick runs in the river. Tie in quill at rear. Create body shape with thread. Secure and cut thread off clean. 3 coats of varnish and wait a week. Week later, build front thread head. Whip finish hack to post, then trim fly clean. Invert fly, apply last coat of varnish. 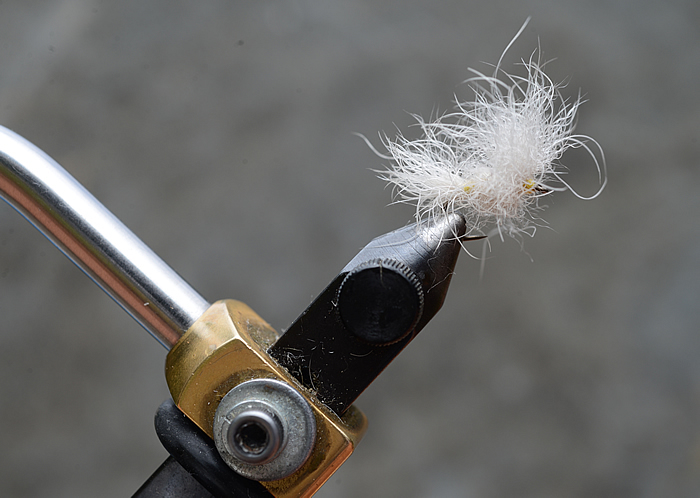 A key part of this fly – or any quill body fly – is time and patience. For me, I apply 3 coats of Veniard’s Cellire Varnish over a day and then set aside for a week for the varnish to harden. For this tie, I am using a large eyed hook, stock given to me by Chris Helm (a Partridge with a large gap and short body). I find the wire large and brittle, showing errors in tempering. 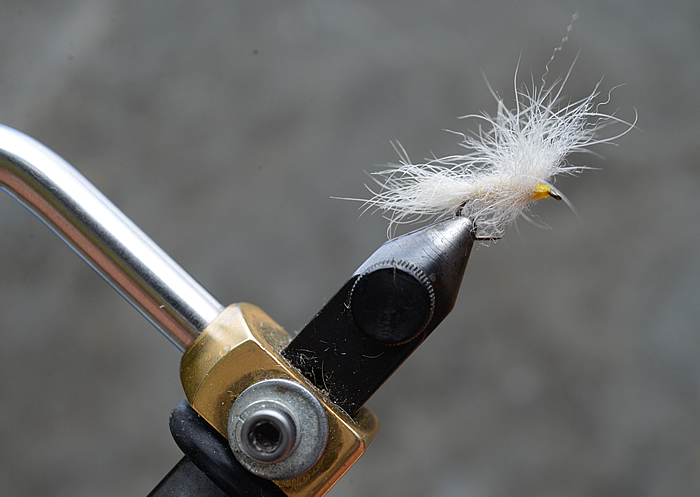 Admittedly the large eye will be very nice in tying on the fly on the river, but I rather use a TMC 103BY for a barbless dry – better wire and better point (in my opinion). Veniard is a great finish and protects the quill well, but patience. Apply 3 coats and lets it harden over a week. Though not done here, the advantage of the break, when you start to finish, you can change the thread colour for the head (upper body), which does exist on many natures. 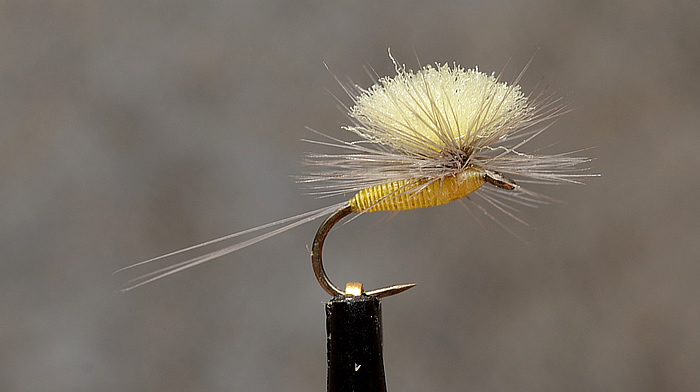 My current Pocket Water Trout fly is the Usual, and here is a Sulphur Head variant. 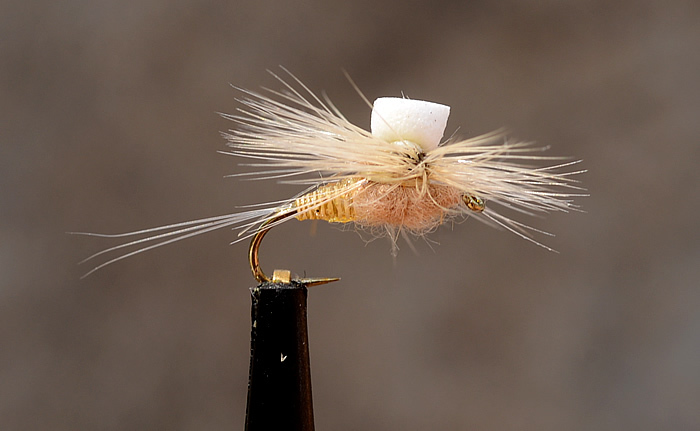 In a previous post, I discuss and look at what would be the best hook for this fly and conclude with the TMC 103Y, but found another excellent option – samples given to me by Chris Helm some time ago – the Partridge SUD. My only concern, they do appear to be brittle, so the metal is not well tempered. 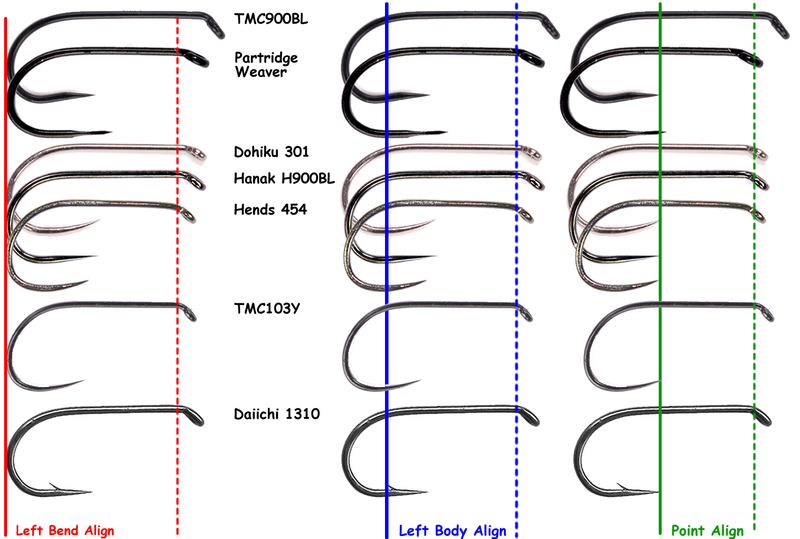 In the previous post, I suggested a using a “shorter” hook than my standard TMC900BL to tie a Usual would be a good thing, so I decided to take a look at what is available, given the recent (within 10 years) growth of hooks resulting from European Fishing Techniques. 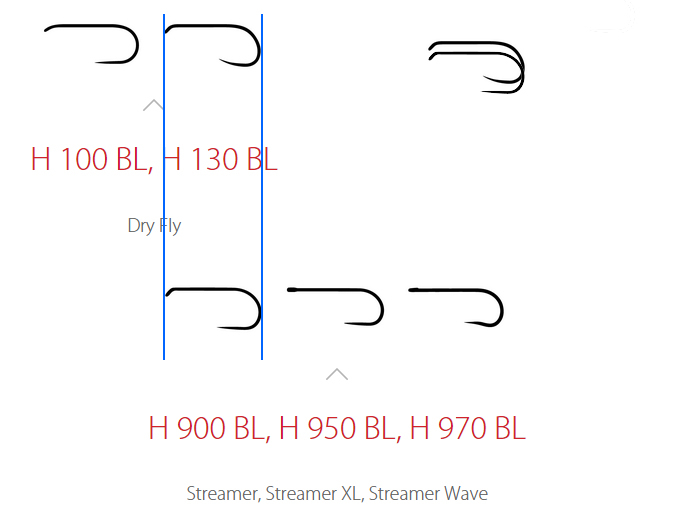 Using what I had, but also Google Images to extract information, here is a comparative look at hooks, where the hook “size” has been equally proportion from the outer bend of the wire. Shorter is subjective, as it can be seen as a function of the length of the hook or the length available to tie the body. Of course we cannot dismiss the point from point to the eye, which is reflected in my comparison. And for reference. I have defined the left end of the body, once the wire has dropped the radius of with wire. 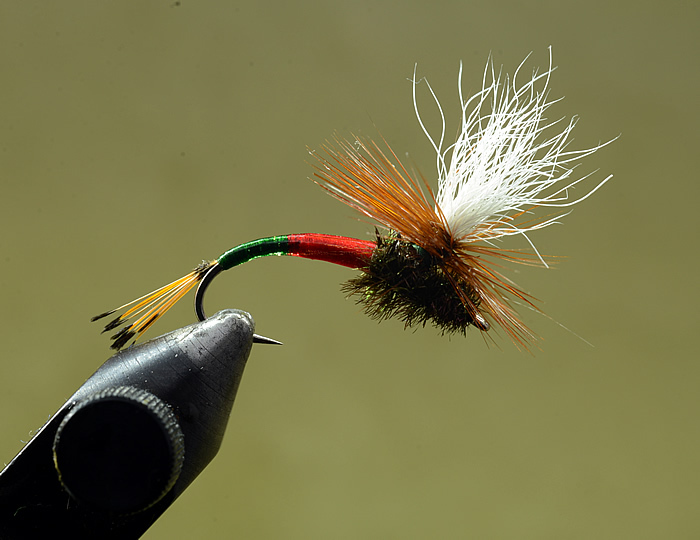 Conclusion: In future, I will be using the TMC103, which will eventually become my new standard for dry flies. 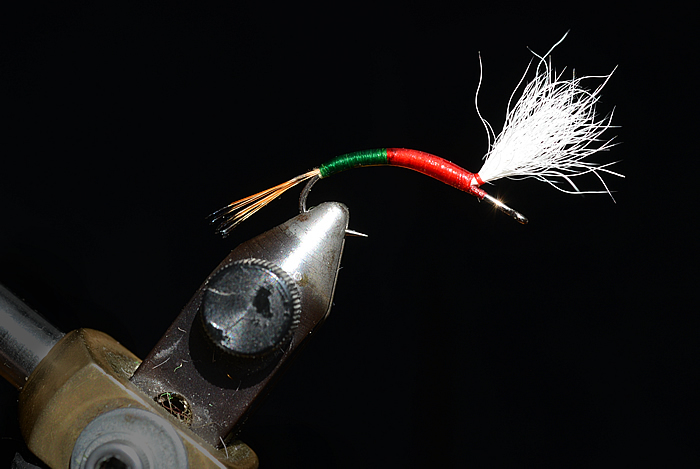 It is a nice light wire barbless hook with a good bend for hooking into the jaw. The Dohiku 301 is a good alternative. I am not sure where-why I got the sample Hanak 900 Hook, when the Hanak 130 BL would be a better fit (size and shape of the point). Short streamer hooks seems to be the norm for Eastern Europe where I cite Dohiku HDN 302 and I suspect reflects some of the older stillwater patterns in Europe. This also leads up to a good additional point to assist in the selection of a hook, what sizes are available, based on manufacturer’s websites (where possible). TMC 900BL – 10-18 – This was my default hook, I still have many left, but I am phasing over to the TMC 103Y. Partridge Weaver – Out of Production – 10-16 (known)(if you can find them). I note that I had samples from Chris Helm of the Partridge SLD, whose shape I like, but found the tempering and brittleness poor enough that I would not order any more. This appears to be irrevelant as these hooks are also no longer made (and I have used up my last hook this spring). Dokihu 301 – 10 to 20 – I also note, the body at size 18 and 20 is reduced relative to the gap, a very smart adaption. The hook I would look to, if the 103Y is unavailable. Hanak – 103BL – 10 to 20 – I have never tied onto this hook. Hanak – 900BL – 6 to 10. Limited sample experience, and would look at the 103BL first. I have a “web” comparison with the 103BL below. As of this update, I have no hooks in my box to add more information. Hends 454 – 8 to 20 – Information from various retailers. I have many flies on these hooks, I am happy with them, but will concentrate on the TMC 103Y, and if necessary compare against the Dokihu. TMC 103Y – 11 to 21 (odd sizes). Courtesy of some gillies in England, my default dry fly hook now. Daiichi 1310 – 8 to 22 – Limited experience, but have had no issues, but prefer the barbless shape of the above hooks. I usually dislike referencing other sites webpages – URL changes et cetera – and depending upon the quality of web designer, links will eventually break. Never-the-less, I have link to so sites for the hooks, but will not maintain them (once the originator breakers them). And what sizes do I use for a TDE dry fly hook 10 (11) to 18 (19). 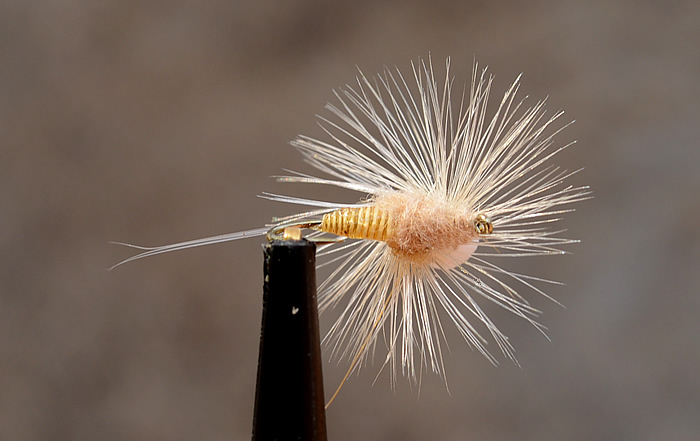 I rarely tie midges or extended body BWOs (when I want a very small hook), I was using Daiichi 1640 (straight eye), but shifted to the Gaelic Midge with a small UTE. As Gaelic (Sprite) hooks are no longer in production, I will be shifting back to the Daiichi 1640 once my stock is cleared out. The sub-text – if trout are feeding on Midges, I am more likely to be fishing for Smallmouth Bass. Last, using Hanak’s images, I have mashed a comparison of the shape of the 103 and 900. I was home for three days (back from Europe (Sweden, Crotia, Slovkia), off to Cleveland) and was able to tie the previously posted “crawfish” and a dozen Usuals. This was my first time with the Usual and hope to give them a run for their money on their “home waters” on the Ausable in NY State in June. 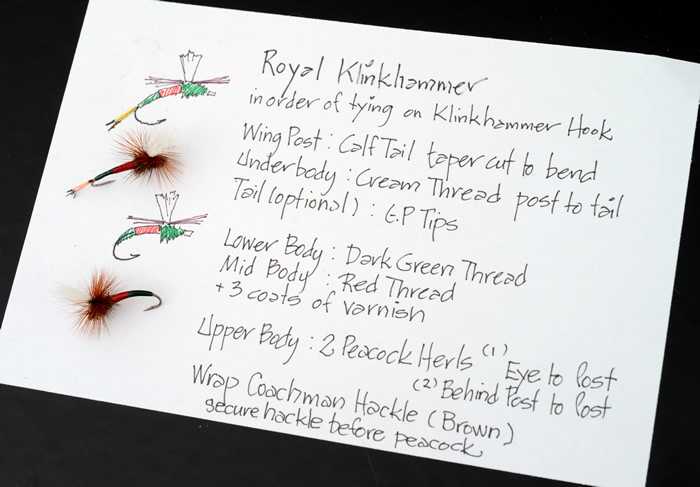 Hook: TMC 900BL – Size 16 – use your shortest shank dry fly. Head – Snowshoe Hare (Cream, Rear Foot, Bottom) Long and Medium Guard Hairs. Dubbing – Snowshoe Hare Fur. 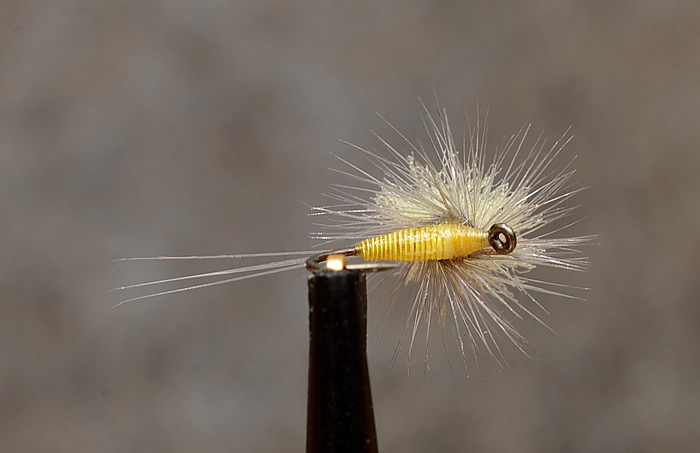 I do hope this fly produces, as I can see this as a goto pattern in the future. The Royal Klinkhammer was done for fun. The idea came about during my production tying of Klinkhammer seeing the red thread through the peacock. My practical observation to pass on, when wrapping a hackle onto a foam post, the post compresses which prevent the hackle walking up and enabling a tight thread versus the calf-tail post that I have used here. Post publication add, from comments in a web forum > Yes, the Partridge Klink Hammers are to big and lack diversity. As such, as I burn through my old hooks, I have been moving to Daiichi. Maybe I will get a better toned picture, but this picture signals the end of my “production” tying for the trout season, where I tying nymphs and emergers. The many (50) Klinkhammers this year had bright posts and quill with contrast thread bodies. 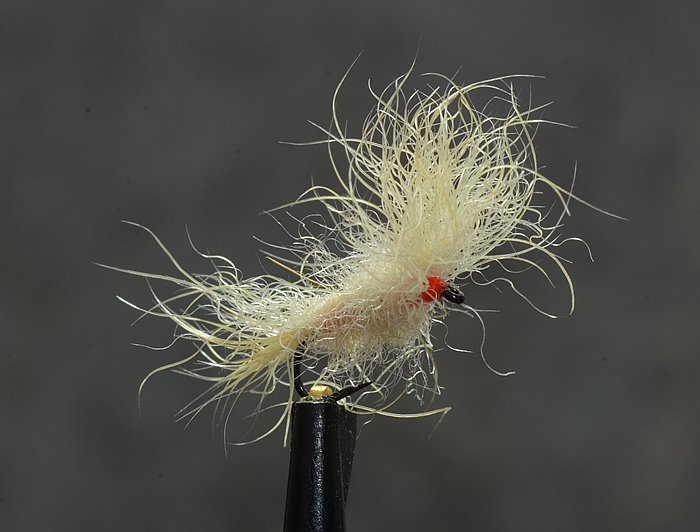 The hackle is a mixture of Grizzly, Cree, Furnace, Coachman and Dark Dun with a red thread underbody. 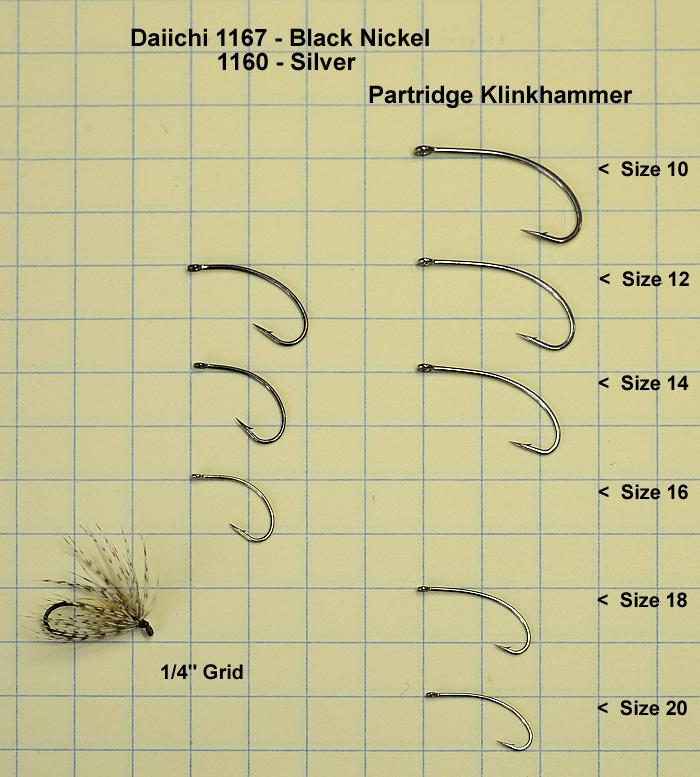 My supply of Partridge Klinkhammer Hooks is coming to an end and have begin to migrate Daiichi’s (D1167) that have a much greater and realistic sizing.